Injured Gadgets is one of the premier USA based cell phone parts wholesale distributor that works directly with leading LCD factories to guarantee you low rates, consistent quality, free overnight shipping with a simple RMA process. We have partnered to provide cellphone stores with a turnkey solution that streamlines out of stock item purchases & automate part ordering so you can spend more time creating a better customer experience and let your software improve your business decisions. 1- In order to Integrate RepairDesk with Injured Gadgets you will need an approved account so you can generate an API token. 2- Please login to your Injured Gadgets account and click on account information. 3- From this page please copy API Token ID and hit save. 5- Please enter your registered email address with Injured Gadgets and "API Token" that was created on Injured Gadgets website and hit connect. 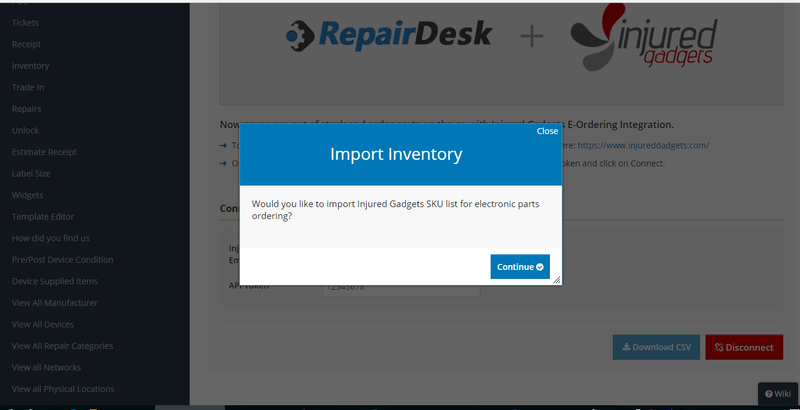 6- Once your RepairDesk account is successfully configured it will show a pop up alert so it can automatically import Injured Gadgets SKU list to your RepairDesk account. 1. Once the integration is successfully configured it will display a pop up alert that will allow you to download latest SKU list from Injured gadget & checkout using a single click. 2. Alternatively you can manually map or bulk import required inventory items with Injured gadget platform by entering Vendor SKU against individual inventory items so the software can display real-time inventory & price information while creating a new purchase order. From purchase order screen you will be able to view real-time inventory levels from Injured Gadget platform so you can adjust order quantity and will be able to checkout with a single click. 2. Alternatively you can create new purchase order and select Injured Gadget as supplier. 3. Search item(s) by name or SKU you want to order and click on add row. Once you add a new line item it will display real-time inventory levels from Injured Gadget platform so you adjust order quantity (if required). 5. Now click on Checkout with Injured Gadgets which will display a pop-up message notifying you that the products have been added to Injured Gadgets shopping cart. Clicking the blue button will take you to Injured Gadgets website with item details. 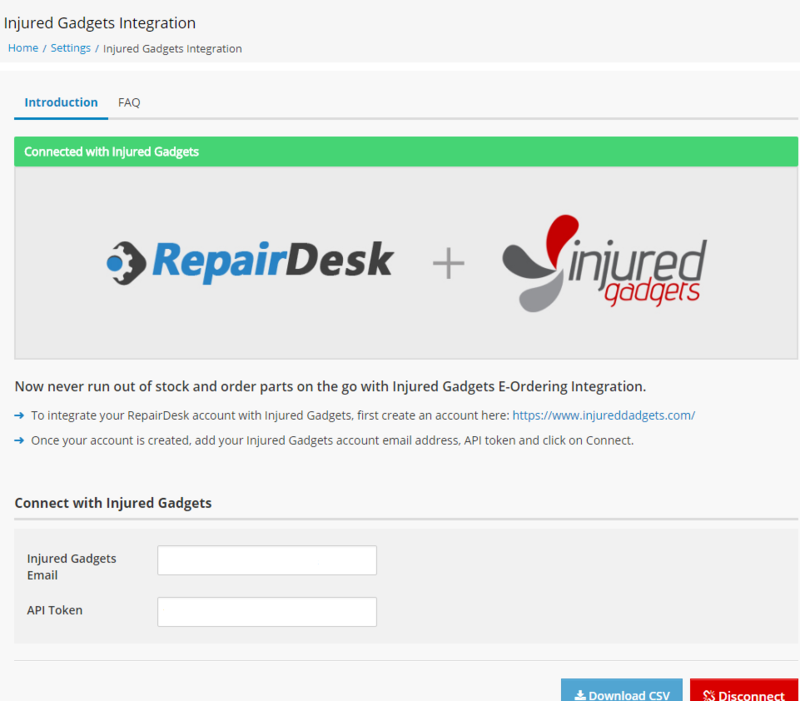 The integration is also smart enough to provide updates when you make changes to your Injured Gadgetscart and will update your RepairDesk Purchase Order with prompts for any changes or additions. 6. Complete your purchase on Injured Gadgets website & once your order status is updated on Injured Gadgets website, it will automatically be updated on RepairDesk too.